Kim Smelter is originally from Atlanta (though she is NOT a Falcons fan and needs to make that clear every time someone asks her where she is from – who dat forever baby). Before joining her beau down in the Big Easy, she lived in NYC for eight years, where she went to NYU, worked in TV production and tried not to lose her southern charm. She visited New Orleans for the first time during Jazz Fest and instantly fell in love. It might have been the Crawfish Monica. Needing a break from the fast-paced life of Manhattan, she decided it was time to embrace the laidback lifestyle, Southern hospitality, creole cookin’ and endless parading and festing that make this city so unique. Kim makes it her mission to know the best places to go in the city and enjoys making itineraries for her frequent guests traveling down here. 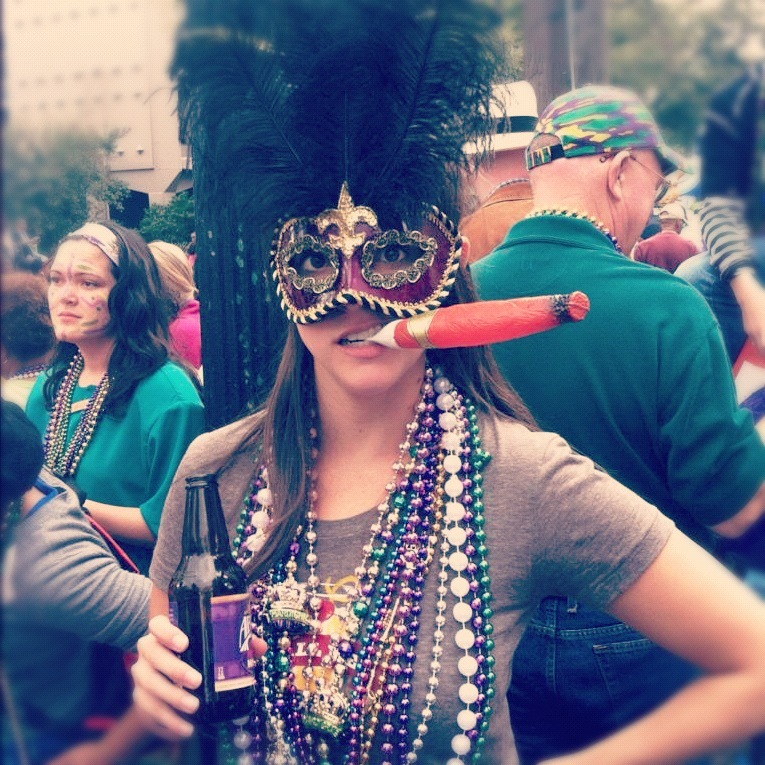 She writes on her own blog, New Girl in NOLA, where you can find tips for restaurants to try, swamp tours to go on and parades to watch. She loves making new friends and trying new adventures so don’t be shy to reach out! Let’s explore this city together, newbies. I started working in the booming film industry here in the city, but after spending too many hours on set and not enough time actually living in New Orleans, I decided to switch gears. So currently I work in catering & conference management for a hotel downtown. The culture here never ceases to impress and amaze me. You really can’t find anything like it anywhere else in the world. I love how much people embrace the past and preserve it. It’s not about building big, shiny high rises or chains. You want to go somewhere that is rich is history and takes you back in time. And EVERYONE can feel welcome and have an amazing time here. How can I pick just one!?! The fried chicken at Willie Mae’s Scotch House is pretty damn delicious. But honestly it is almost impossible to find bad food here. The potholes in New Orleans are ridiculous and I wish I had an SUV. I did not realize I would be going off-roading every time I left my house. Not having delivery. Seriously why can’t this town deliver! And I need more late night pizza, please. I have a list on my phone of places I want to see, eat, and do. The list grows faster than I can check things off. But on the tippy top of that list is to venture out onto River Road and see some pretty rad plantation homes. I wish I went to high school here (or at least pretend like I did) so I could feel more like a local. Oh and I need to meet people who live on St. Charles. My bathroom situation for Mardi Gras needs some tweaking.